Cinderella is a tale of social transformation, a tale that begs the question “what is it like to walk a mile in my shoes”, and it is a tale that centres around a shoe, around a glass slipper. It is a shoe that speaks as much to its impracticality as it does to its power to display. Cinderella’s shoe is a commentary on class and the notion that clothing can create identity, that wearing a particular type of clothing can create a particular performance of selfhood. These images examine the glass slipper as a central part of the Cinderella narrative and its fragility perhaps mirrors the fragility of wealth and identity. Chris Thompson’s “Cinderella’s Glass Slipper” explores the centrality of glass for the Cinderella story, creating a work that explores the fragility of story by transposing Cinderella’s image onto the heel of her glass slipper. The focus on creating Cinderella’s body from the bridge of the heel of the shoe illustrates her fragility and her association with the pain that is often associated with walking in heels. Thompson’s use of a stained glass style links fragility to the notion of the fractured body. The Cinderella tale is one that is mutliplistic, with multiple pieces pulled together to form a narrative. Thompson portrays Cinderella by herself on the shoe, which is significant since many images of the glass slipper tend to either show the prince picking up her lost shoe or putting the shoe onto her. This image focuses on Cinderella as complete in herself rather than an extension of her prince’s narrative. Alexandra Dawe’s “Cinderella” accentuates the connection between the Cinderella narrative and time, portraying the clock just passing midnight and Cinderella on the ground in a look of despair. This is a Cinderella who believes that she has missed her opportunity, that this, like so many of her potentials in life, has gotten away from her. 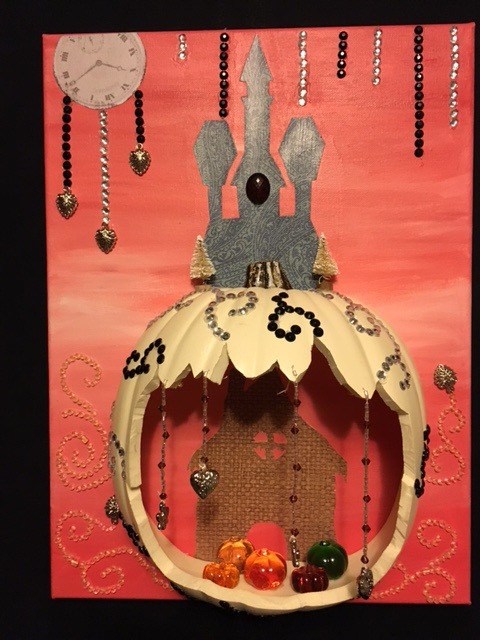 Dawe illustrates Cinderella in rags and surrounded by other images of her poverty that were also figures transformed by her fairy godmother into representations of royalty – her rats and her pumpkin. Yet, leaning up against her pumpkin is her glass slipper, connecting the wealth that could have been to what she believes her circumstances are now. Only one shoe is illustrated here, likely showing that this is the matching shoe to the one left on the stairs down from the palace. The slipper has become a reminder of what she believes she has lost. The gears and works of the clock contrast nicely with the image of fairy tale magic, bringing magic and machine together in a way that paints this tale as one about the mechanics of human interactions. Jasmine Beckett-Griffith portrays Cinderella in wide eyed doll-like innocence. This Cinderella is associated with time like Alexandra Dawe’s figure, but her pocket watch has just struck midnight and she is portrayed still on the stairs with her glass slipper behind her. Both Cinderella and her rats are portrayed in the act of transforming. Cinderella has her peasant clothes on with patches sewn into them, but she still has an expensive pocket watch and her hair is still done up in aristocratic style. Her mice are similarly transforming with some of them still in a state of shimmering brilliance behind her and those on her lap fully in their rat form. The centrality of the clock in this image is illustrated by the drifts of glittering dust falling from it onto the pumpkin, rats, and shoes, connecting this dust to the residual magic of her transformation. Beckett-Griffith seems to make the watch the agent of change, highlighting the role of time in this narrative. The use of dust in the image also conveys a sense of the connection between magic and time since it is the literal settling of the dust here that denotes that her time has passed. Joel DeQue connects the Cinderella tale to the moon, exploring the power of the night as a place for transformations. This is especially significant for Cinderella’s connection to the ball, where she experiences her transformation over the course of an evening. DeQue only shows one shoe peaking out of the bottom of Cinderella’s dress, which has taken on the form of a constellation in the night sky. Her glass slipper mirrors the glass bobble hanging down from the horn of the moon above Cinderella’s head. By connecting moon and slipper, DeQue highlights the transformative power of both – the moon changes over the course of the month as it goes through moon phases and the slipper changes Cinderella over the course of the evening from maid to princess to maid again and it will eventually reunite her with her princess identity when she is reunited with her lost shoe.